I adopted an african grey yesterday, as I have wanted one for many years. She came from an elderly couple who are very nice people. She supposedly had a great home. When I got her yesterday, she came out of the travel cage and stepped up. We assembled her new cage, and since I have had her in it, she will take food from me, whistles, talks, etc, but will NOT step up without trying to bite. Actually, she wont even come out of her cage today, and she did yesterday. Ive left her door open. I know shes new to my home and will need time, but im wondering if this is territorial or out of fear and whats your tips? She is 10 years old and seems healthy as well. Update: She flew down from her cage, I went to pick her up. She stepped up. I sat down with her at my computer desk and she hopped down onto my keyboard. I let her be. She looked at me while my arm rested on the desk and said "you wanna go up?" (I guess thats the term her previous owners used instead of "step up") so she climbed on my arm. She extended her head down to my keyboard and tried to tear the keys off. I said No! Out of my instinct and she bit my shirt and tore a big hole in it. I guess this is bitter sweet progress in one sense but I just dont know. Its like its a mix of fear and territorial biting. Help guys! You’re trying to move way too quickly. I’d spend the next month just trying to let the bird get used to the home and you. Give it treats if it will take them, and don’t try to pick her up. Let her get adjusted to you and to the home. Navre wrote: You’re trying to move way too quickly. I’d spend the next month just trying to let the bird get used to the home and you. Give it treats if it will take them, and don’t try to pick her up. Let her get adjusted to you and to the home. Yes, I agree I have been way too excited at the fact of knowing shes here and I have just slowed down and havent tried messing with her unless needing to change her food or give her treats. She will take the treats out of my hand just fine but other than that, she does not like hands yet and does not care to make "fart" noises at you if you get your hands near her. Her previous owners said she will soon adjust and until then, be ready to pull back quickly. I feel like other than the hand thing, she seems happy so my plan is to just let her come to me when shes ready. After all, I am going to have her the rest of my life! With the cockatiels I would let them fly until they were tired and landed. They willingly stepped up on my finger to be put back. That is the only time I could touch them for a very long time. Before Myrtles feathers grew back she would test her wings and land on the floor. She would then walk to me and climb up my leg to my shoulder so I could walk her back to the top of her cage. It took a year for her to accept that I am not going to eat her. If the bird has been clipped it is double fearful. Open the cage and have a perch set up to be at face level. They are not afraid of faces and will communicate. It would also be good to set up it's cage with a perch inside at face level. Keep your hands out of her cage unless to clean or change foods. When you have to go in cage keep your palm down. Also you can put some treats outside the cage. Keep the carrier set up for him as his refuge. I have had Phoenix for 4 years now. He is just allowing me to touch his beak when he is at the feeding tray. I move the foods closer to his beak and touch him then. He has been communicating with me for the last 3 years or so but was afraid of touch. Other of the cockatiels will land on me when I am in their room. Since they land on my back I can't tell which ones are doing it. I love them all so much. They can do what they want to do and I will just wait for them to show how much they love me. I know I talk about my birds a lot but they are the only examples I have. liz wrote: With the cockatiels I would let them fly until they were tired and landed. They willingly stepped up on my finger to be put back. That is the only time I could touch them for a very long time. Good point there. Chloe's feathers were clipped pretty jagged so that could also be making her more fearful. Yeah, the only time I have been in her cage the past two days is to either change her food and water or give her a treat. I like the idea of a perch being higher next to her cage. Chloe has only flew down a couple times and im not sure why, but it often results in a bit of a crash, given whoever cut her wings did so horribly . I am hoping that she will walk over to me some day. Your situation with Phoenix sounds similiar to mine with chloe, will communicate with me but no touching! If she cannot glide down and land gracefully, I would not put a perch up high. She could fall and hurt her keel bone -and that's a real nasty place to get hurt because it hardly ever heals correctly. The advice of putting a branch sticking out or a perch high up is good but wait until she grows back half her remiges before you do that -and this only if she was allowed to fledge correctly and learn to fly when a baby because, if she has been clipped all her life, she never will fly right so you will need to take that into consideration. Like Navre said, you are going to fast. Grays take longer than other birds to get used to their new home because they hate change and bond very deeply to their humans so, if I were you, I would not ask her to step up or anything. I would just open the door to her cage at dawn and allow her to do whatever she wanted to do [do you know for a fact it's a she?] during the day because, if you feed her right, she will go right back in when you give her dinner at dusk. PS Parrots usually step up from the floor even when they don't do it at any other time [it's a safety thing]. Pajarita wrote: If she cannot glide down and land gracefully, I would not put a perch up high. She could fall and hurt her keel bone -and that's a real nasty place to get hurt because it hardly ever heals correctly. The advice of putting a branch sticking out or a perch high up is good but wait until she grows back half her remiges before you do that -and this only if she was allowed to fledge correctly and learn to fly when a baby because, if she has been clipped all her life, she never will fly right so you will need to take that into consideration. Well, grays can be visually sexed so check the tail undercoverts [these are the smaller red feathers that 'cover' the beginning of the longer red feathers -these are called rectrices- that make the tail], if they are all red, it's a male, but, if they have a grey edge [it can be super duper thin and, if the feathers are worn out, it would have disappeared], it's a female. There are two other ways of checking: the length of the wings when folded [if the tips reach the end of the tail it's a female, if they are shorter than the tail, it's a male] but you can't do it with clipped wings. Third clue is the gray under their wings, if there are two shades of gray, it's a female, if there are three, it's a male - but this requires your being able to put the bird upside down and open the wings so it's not doable for everybody. Now, please don't take this the wrong way because I am not trying to pop your balloon but to explain something that you might not know about parrots: nobody knows why a bird bonds with one person and not another - and being the 'owner', the bird lover, the caregiver, the one that is there all the time does not mean anything to them. They love whom they love and there is very little anybody can do about it. So, please, do not think you did something wrong or be terribly disappointed if she doesn't choose you because you can still have a good relationship with her. Most of my birds prefer me but there is one [Isis, female African Red-Bellied] that chose my husband - and he is not even a bird person! And there are others which like and trust me and, up to a certain point, love me in some way but for which I am not the 'chosen one' and never will be. Pajarita wrote: Well, grays can be visually sexed so check the tail undercoverts [these are the smaller red feathers that 'cover' the beginning of the longer red feathers -these are called rectrices- that make the tail], if they are all red, it's a male, but, if they have a grey edge [it can be super duper thin and, if the feathers are worn out, it would have disappeared], it's a female. There are two other ways of checking: the length of the wings when folded [if the tips reach the end of the tail it's a female, if they are shorter than the tail, it's a male] but you can't do it with clipped wings. Third clue is the gray under their wings, if there are two shades of gray, it's a female, if there are three, it's a male - but this requires your being able to put the bird upside down and open the wings so it's not doable for everybody. Thank you for that information ! I cant tell too much based on the wing feathers because I cant hold her to see just yet, but from looking at her head shape, her solid red tail feathers, and dark grey all over, I think "chloe" is a boy . LOL But I am almost afraid to get her sexed because if she IS a boy, I dont want that awkward moment. I understand what your saying. No balloon popping here! 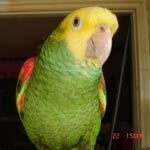 Thats how my grandmas parrot was and I still loved him. (she raised me 80% of the time) So far, she hasnt bonded to either one of us. I spoke with the previous owners and they said that she was like this when they first got her at a young age. They said once she gets to know me she will be loveable. I am just holding on . She takes treats from my hands without biting, just no step up. And I havent tried the step up since the second day I got her, just trying to let her be. Just the food! I have ladders for Phoenix. That way he can climb up and down from where the others are. Their cage has multiple doors so I have more than one ladder in case someone is blocking one. Rainbow climbs up on the side of her cage to get back up on top or walks over and asks for help.